Today, I have a color for you that’s screaming for summer! How fitting, since today’s weather sure feels like summer, at least here (it’s 86 degrees today!). Regardless of the season, it’s a gorgeous bright polish that will satisfy your pink cravings, so let’s get started! 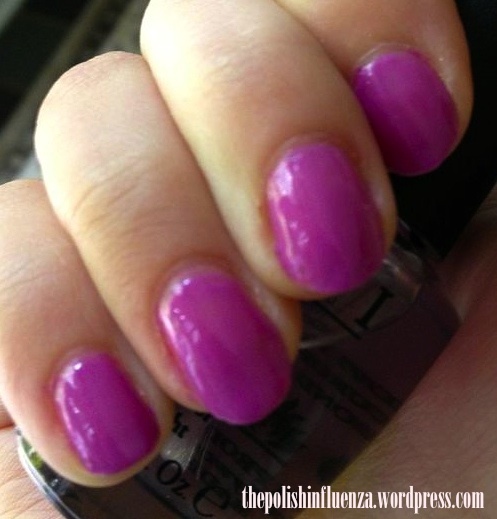 Essie Splash of Grenadine is from the 2010 Resort collection, and it is a hot magenta creme. It does lean a little purple in some lights, but I think it’s still pink enough to qualify for my Wednesday post. Consistency-wise, I’d probably call this formula a “crelly”, since it’s most definitely a creme, but it’s squishy enough to be a jelly as well. Best of both worlds! It’s a bit of a sheer color, but can be built to full opacity in 3 coats. It also dries pretty quickly, so it’s not a problem to do multiple coats. It is somewhat thin, so be careful not to flood your cuticles, but with a little patience, this polish applies beautifully! It’s also SOOO shiny! Pictures below are 3 coats of Splash of Grenadine, no topcoat. Sorry that the second picture is slightly blurry, but the color is still very true to life. So what do you think of this bright magenta? I think it reminds me of raspberry sherbet, it looks like a great, fruity treat! Let me know in the comments if you like Essie pinks like this one! Essie polishes can be found at most drugstores (like Walgreens, RiteAid, etc.) beauty supply stores (like Ulta) and on their website, here. Categories: Essie, On Wednesdays We Wear Pink | Tags: crelly, creme, Essie, magenta, nail polish, on Wednesdays we wear pink, pink, Resort 2010, Splash of Grenadine | Permalink. Now I’m dying to watch Mean Girls ^_^. Great post! I’ve been looking for a bright raspberry color and this is perfect! I totally agree! This color is fantastic! I wish I owned it, I borrowed my bottle from my neighbor, lol! Gotta love trying it out before you buy it though!